Commits Claim Junior Titles - College Hockey, Inc.
Fargo won the best-of-three Clark Cup Final series against Youngstown in four games (Photo by Hickling Images). Dozens of Division I commits will come to campus with championship pedigrees after capturing USHL, NAHL and RBC Cup titles in the past two weeks. Half of all teams – 30 of 60 in Division I – had a recruit on either the Fargo Force (USHL), Shreveport Mudbugs (NAHL) or Chilliwack Chiefs (RBC Cup). All six conferences were represented among the champions, while independent Arizona State is the only program with recruits on all three championship teams. Fargo captured its first Clark Cup as USHL champions with a 3-1 series win against Youngstown, closing the series with a 4-2 victory Saturday night. Northern Michigan commit Griffin Loughran earned Clark Cup MVP honors after scoring seven goals in 13 playoff games. Maine, Michigan, Minnesota and North Dakota each had a pair of commits among the 21 future college players who suited up for the Force in the playoffs. Former North Dakota player and assistant coach Cary Eades led the Force as head coach, earning his second Clark Cup in the past four years. Shreveport captured the NAHL’s Robertson Cup with a 2-1 victory against the Minot Minotauros on Monday, May 14. The Mudbugs erased a 1-0 deficit with goals from uncommitted prospects Brendan VanSweden and Cole Quisenberry. Robertson Cup MVP Jaxon Castor stopped 15 shots for the Mudbugs to secure the victory. The Arizona State commit was joined on the all-tournament team by a pair of future UMass Lowell defensemen in Nolan Sawchuk (Minot) and Dominick Procopio (Shreveport). The host Chilliwack Chiefs of the BCHL stood atop the five-team RBC Cup after beating the OJHL’s Wellington Dukes, 4-2, in Sunday’s championship game. 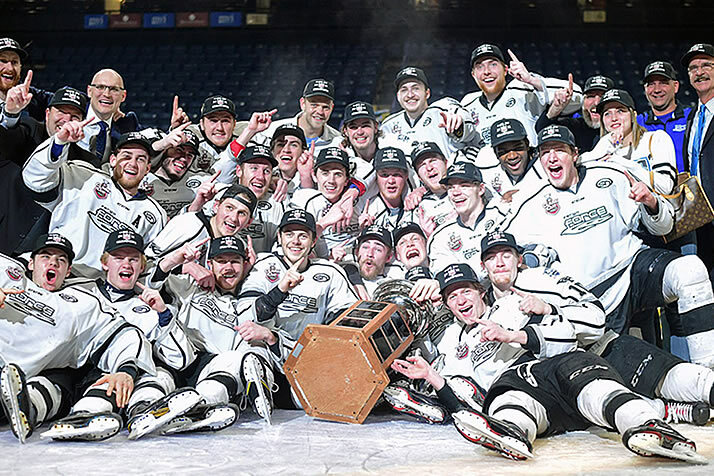 The Chiefs scored three third-period goals to become the second host team in as many years to win Canada’s Junior A national championship. The Chiefs won under new head coach and Michigan State alum Brian Maloney despite a nine-week layoff following a first-round BCHL playoff loss. Ten schools had commits on the Chiefs roster, including a pair headed to both Holy Cross and Michigan State. RIT commit Will Calverley scored six goals in the tournament, including one in the title game, to capture RBC Cup MVP honors.